Last week, alternative rockers Kings of Leon and Arctic Monkeys were announced as headliners for Lollapalooza 2014 alongside rap icon Eminem and EDM superstar Skrillex. 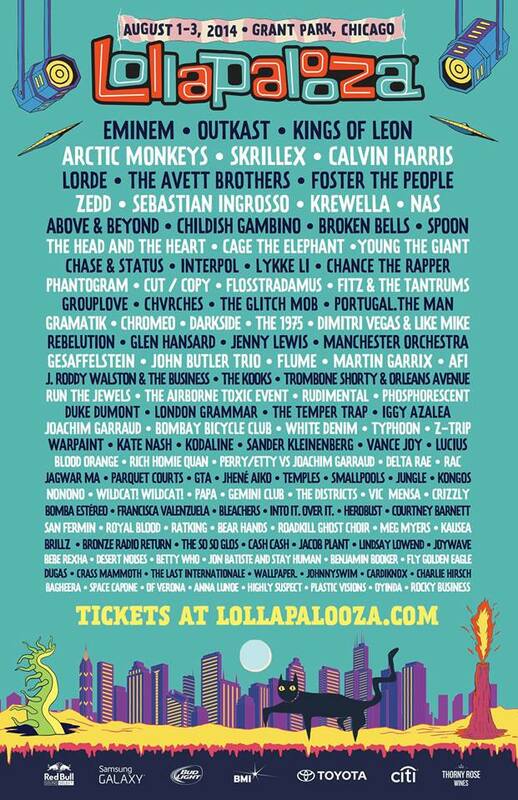 All four acts are Lollapalooza alumni. In 2011, Arctic Monkeys made their debut and Eminem headlined. Kings of Leon headlined the festival in 2009 and Skrillex performed in 2011 and 2013. 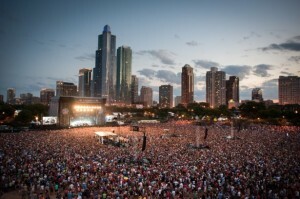 The festival’s 10th Anniversary is set to take place on August 1-3 in Grant Park, IL. Today, a full lineup was announced, with Outkast and Calvin Harris signing on as the final two headliners. Also added to the eclectic bill are a slue standout rock and alternative artists including Cage The Elephant, AFI, The Avett Brothers, Young The Giant, Foster The People, Interpol, The 1975, Fitz and The Tantrums, The Airborne Toxic Event, Royal Blood, Portugal. The Man, Temples, The Head and The Heart, Manchester Orchestra, John Butler Trio, and many more. Last year’s lineup boasted stellar rock artists like Nine Inch Nails, Queens of The Stone Age, Mumford and Sons, The Killers, The Cure, Imagine Dragons, Ghost B.C., and many more. A complete lineup with additional headliners is expected to be announced next week. Tagged AFI, Arctic Monkeys, broken bells, Cage The Elephant, calvin harris, childish gambino, eminem, Fitz and The Tantrums, Foster The People, interpol, joh butler trio, Kings of Leon, lollapalooza 2014 complete lineup, lollapalooza 2014 lineup, lollapalooza festival, lollapalooza full lineup 2014, outkast, outkast lollapalooza, portugal the man, skrillex, The 1975, the airborne toxic event, The Avett Brothers, the head and the heart, Young The Giant, zedd.